For this week's Tuesday Treasure I want to share a picture of a sweet little teapot, which is really only big enough for about one cup of tea. This belonged to my great grandmother, Della Mae (Swinford) Kephart. My mom brought this to me, along with several other special things that had belonged to Grandma Kephart, a few years before Mom passed away. And of course it's something I treasure. 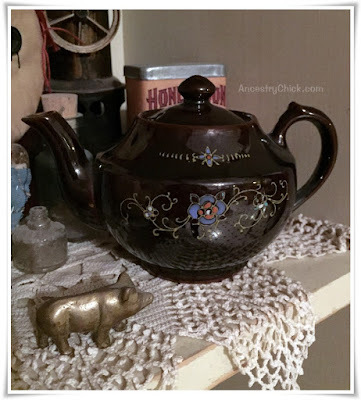 Mom said that Grandma did use this teapot to make herself tea. I love that blue flower on the brown background, and the scrolls and swirls of green leaves. And I love even more that I can imagine Grandma Kephart fixing herself a nice hot cup of tea with it. I've often seen similar teapots to this at antique stores and such. Most of them time they are bigger than this one. I don't know if it's even valuable...but it's priceless to me, and I'd never sell it. There's a note tucked inside of it, stating who it's original owner was, so that my daughter will know after I'm gone. I've started doing that with a lot of family heirlooms and other special things around the house. If no one but me knows their story, then once I'm gone the stories will be gone too. So I'm hoping that by adding notes or labels to everything that's important, my daughter and grandkids will know where these things came from. After all, preserving the family legacy and history is the goal.